This is the season for hunting Autocrats and fascistic elements. It is fun and worthwhile to examine what the analysts say about such leaders. Some say that they often overreach because they don’t hear any fruitful analysis or any criticism from henchmen surrounding them; and even the critical voices in their inner circles are neglected and often prefer the company of sycophants. If you worked for a strutting strongman, you would likely be reluctant to be the bearer of bad news to your leader. Thus the leader shifts from the truth, unless leader is capable of moving out to consult independent job related intellectuals time to time. In general it is observed that in the military, the most capable officers may be less likely to rise than the most loyal. If the leader has a time limit he may be positive and alert. When one has no term limits or put in place a President for life, it can breed decay. It is true that while innovation is flourishing in some sectors within certain autocracies, one has reason to question whether innovation will be undermined in the long term by the absence of freedom of speech and the presence of constant fear that kills the innovative spirit. 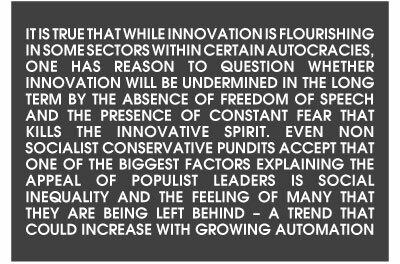 Even non socialist conservative pundits accept that one of the biggest factors explaining the appeal of populist leaders is social inequality and the feeling of many that they are being left behind – a trend that could increase with growing automation. But there is no reason to expect that autocratic or authoritarian systems that concentrate power at the very top will more equally distribute benefits, than liberal democracies. We see the terrible challenge to liberalism and democracy. In fact it is childish to discuss socialism without concerning the plight of poor or displaced people even in the developed world. The struggle over fence to divide the poor from the rich led by Donald Trump is an embarrassment to humanity. Are we to laugh or cry; no one really knows. In Lanka we are still to give the powers included in the 13th Amendment to the suffering people in the North East. This is the 13th Amendment, that was brought in by JR. I hoisted black flags against him when he assumed dictatorial presidential powers. I was locked up and thrown out of Engineering Faculty. Today many have realized that what I predicted was correct. However I am concerned that same JR brought in 13th Amendment to give limited self determination to minority nationalities, but the task is not finished even by the regime of his nephew Ranil Wickremesinghe. 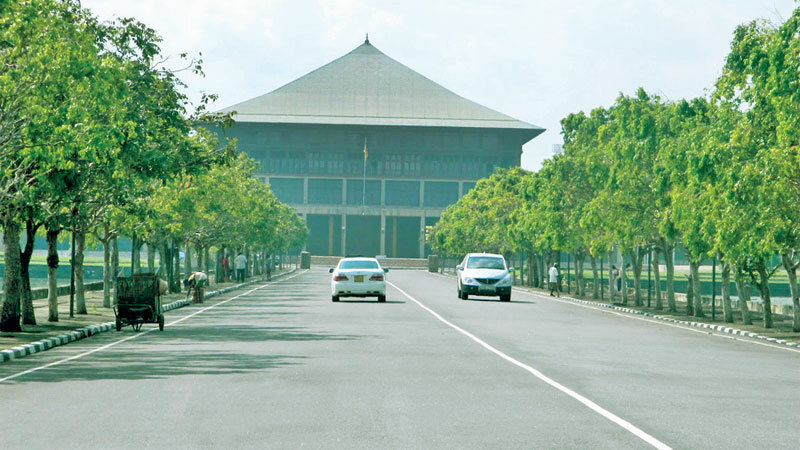 Of course Premier Wickremesinghe has promised to complete the process within his term in this year. There are no easy ways when it comes to problems like these. But self negation cannot be the answer. Yet a confidence gap seems to have overtaken justice and liberalism in this world. Authoritarians’ strutting around, though their model rests on very fragile foundations. On the other hand democrats, appear to be running for cover. This is absurd, that in a world were proletarians are dominating the street with demonstrations, that nullify autocratic decisions of Donald Trump. At the surge of postmodernism a book about the global triumph of liberalism - democracy was produced by Francis Fukuyama. It claimed that the liberal democracy has arrived leading mankind to ‘The End of History and the Last Man’. Post modernist told us its thesis “that there is a…common evolutionary pattern for all human societies…in the direction of liberal democracy” is unfolding before us in coming future. Things didn't turn out that way. Today, people have begun speaking of democracy’s decline and the rise of fascism with fear and uncertainty. We must stop making the mistake of listening to one pundit and then replacing the narrative – about the inevitable spread of democracy, with the satanic arrival of fascism. Recent events within established western democracies like the United States, are lessons to the modern proletariat and the educated masses. One cannot take for granted, as already that masses have taken for granted – the durability of liberal institutions, the status of science, and attachment to facts. Change is inevitable, as Leftists are explaining change is in the positive direction. If one looks at most autocracies and what lies ahead in terms of their ability to deliver for their people, one would choose the resiliency and possibility for self-renewal of democracy. It may not be the liberal democracy as explained in old books but democracy with equality. Despite the real and frightening backsliding picture, looking at all four of the most widely used and accepted databases that assess democracy over time, the percentage of democratic countries in the world in 2018 were at or near their all-time high. It is positive; all other indicates for education, commonsense, vigilance and sensitivity show a future full of participatory democracy. However one could unfortunately hear, very few democratic politicians making these points, but allow me to summarize the essence of the argument: democracies are giving the better model! In autocracies economic growth is likely to be impeded by undemocratic state-owned enterprises and a lack of transparency in the economy. These are not socialist projects. Socialism comes only with total democracy at the top as well as at the base. Even in China growth is slowing, and one wonders how secure investors will feel with the arrest of foreigners and the absence of due process of law and property rights.